The individual performance review ranks among the most loathed practices that companies use to manage talent. Human resource organizations such as the Corporate Leadership Council, Corporate Executive Board, and the Society for Human Resources Management have reported that an overwhelming percentage of managers and employees view their company’s current performance review practices as ineffective, demotivating and unhelpful — in a word, broken. In the utility industry, a recent survey of Western Energy Institute (WEI) Member Companies showed that only 6 percent said that their performance management practices were highly effective at motivating employees, and only 12 percent said that these practices were highly effective at driving company performance. Yet, despite these views, performance reviews have endured for decades. Fortunately, this is changing. Companies across a broad swath of industries, including utilities, are implementing new and innovative practices intended to improve outdated models that could create business liabilities. Technology is facilitating this transformation. Mobile applications, for example, are being used to provide employees with real-time coworker and supervisor feedback to shape ongoing performance. Online learning tools are also available that can be customized for individual employee needs. In addition, most companies use established human capital management (HCM) systems that are slow to evolve and expensive to change. As a result, some companies are turning to smaller vendors with applications that are flexible enough to accommodate performance management practices that better align with business needs. Today, work processes are not necessarily limited by the capability of a host HCM system — quite the reverse. Management can design optimal processes and find an affordable, cloud-based or installed application to accommodate specific design parameters. The practices that many companies use today have roots in an industrial era when an individual’s performance was easier to observe and measure, where work was routine and mechanized, and was performed in a more-predictable environment. New performance management practices are required in today’s utility industry as positions evolve and modernize with the times. Not surprising, legacy models are simply too fixed and inflexible to keep pace with today’s operating environment. 4. Contribute questionable value to organizational performance. Most companies’ performance management models primarily rely on practices that follow a familiar cycle: Set individual performance goals, conduct a midyear status review, conduct a year-end annual review, assign a performance rating, administer compensation and repeat this cycle the following year. • technology applications that provide employees with real-time feedback. In addition, multipage, written narratives that managers and employees dislike are being replaced with short summary statements, often one page or less. Also falling out of favor are forced rankings and the bell-shaped, performance-rating curve. General Electric, for example, eliminated performance ratings and forced rankings entirely, instead adopting a model where employees receive frequent feedback from manager and coworkers throughout the year. Others have paralleled these trends, including Adobe, Gap and Microsoft. Recent research has shown that rigid rating and ranking practices actually could damage employee morale and engagement. Essentially, the tide has shifted from a model designed to measure and assess past performance, to one that looks forward to continuously improve it. Traditional performance assessment still matters, but it’s not the singular focus of the past. Change is also taking root among WEI Member Companies. A recent survey of WEI Members conducted in winter 2015 shows that almost half of the survey sample (44 percent) now requires leaders to conduct frequent coaching sessions with their employees, and a third say they now set more-challenging performance goals. One leading-edge organization is UNS Energy Corporation. UNS has adopted some innovative evaluation practices, such as using a robust workforce planning process to align employees’ performance goals and personal development plans with the company’s strategic objectives. UNS also encourages managers to conduct frequent coaching and performance discussions. In addition, managers adjust goals as necessary throughout the year to keep pace with the ever-evolving direction of the business. While the company retains the use of performance ratings, they use calibration sessions to ensure that employee performance is assessed objectively across the organization. According to the WEI Member Company survey, several traditional practices have fallen out of favor. Two common ones are: forced distributions across performance rating categories (the infamous bell-shaped curve), and a forced ranking of employees based on their performance. These findings are consistent with the broader trend away from performance management as an assessment vehicle, toward one of performance coaching, feedback and continuous improvement. Still, some legacy practices are slow to evolve. For example, the annual performance review rating is still used by most companies. The survey showed that 88 percent of WEI Member Companies are not planning to eliminate ratings, primarily due to their linkage to compensation, and the need to support employment actions such as promotions and terminations. A middle ground is also emerging. Gaining momentum is a trend to change the ratings distribution away from a normal, bell-shaped curve to one that resembles something like a ski slope, or a J-curve, (also called a Paretian or power law distribution). An argument can be made that the bell-shaped curve fails to represent true performance distribution because the vast majority of employees perform adequately and very few are superstars. Companies that accept this model adopt the logic that a small portion of employees (10 – 15 percent) produce 80 percent of the productivity. • on-demand learning and training content. General Electric developed a proprietary smartphone app called PD@GE (Performance Development at General Electric), which enables employees to solicit or receive real-time feedback from coworkers and line managers. The idea is simple: Encourage employees to self-correct their performance proactively with more-frequent, timely feedback. The application also compiles this feedback into a summary at year’s end, thus reducing the administrative burden on line managers. A side benefit to these applications is that they enable companies to conduct sophisticated workplace analytics. Sears, for example, uses data obtained through feedback tools to map and analyze interactions across and within the organization, called “social network analysis.” This can be useful when cross-functional collaboration is important, but it may not be fully optimized. Others use it to understand performance trends of individuals and to examine how key events in the organization may enhance or degrade productivity. On the learning side — through the integration of e-learning applications with big data and prescriptive analytics — companies can create dynamic learning and career paths that provide personalized guidance and made-to-order development planning. These platforms offer highly customized recommendations for content, courses and developmental experiences based on the skills, interests and aspirations specific to individual employees. With dozens of “new-entrant” technology vendors now selling innovative, next-generation applications, some established, enterprise-level software providers are struggling to keep up. Most remain focused on prescriptive process models. But with many companies looking to consolidate talent management applications into an integrated suite (that links recruiting, succession and career management, competency profiles and compensation), established vendors might eventually have an advantage due to their size and scale. While the technology landscape is increasingly fragmented with partial solutions, eventually the market will consolidate. But it’s too early to predict how or when this might happen. WEI Member Companies that wish to update their performance management practices have many technology options, including adding specialized applications or choosing a solution that operates within the confines of an established platform. In most companies, performance management and compensation are inextricably linked. Therefore, the impact of new performance management models on compensation is of great concern. Companies on the leading edge offer learnings that could be replicated. For example, a Midwest utility company implemented a rating scale similar to the J-curve mentioned above. It assumed that the vast majority of employees perform adequately, less than 1 percent performs poorly, and a small percentage (10–12 percent) delivers a disproportionately high amount of value. Retention of employees in the latter category is critical and losing them would impact organizational performance significantly. Accordingly, their merit compensation matrix was adjusted to provide a much higher award to these superstars, while still rewarding the majority of employees adequately. Consequently, their overall merit budget remained in check. The utility also positioned the top of the J-curve, where most employees were rated, as a reflection of perfectively acceptable performance. The small number of poor performers were taken out of the rating and compensation systems entirely, and were placed on performance improvement plans or asked to exit the company. Another company, PricewaterhouseCoopers (PwC), eliminated ratings and allowed employees a choice of awards, including bonuses. Employees can select awards such as cash, gift cards, product packages, or even matched charitable contributions. Other companies have adopted a similar model and implemented the use of “spot bonuses,” which are awarded for good performance anytime during the year. Another company awards individual employees “points” for exceptional performance, which accumulate into an annual bonus award. Funding for this is combined with the merit budget to avoid labor cost overruns. In essence, a clear trend is emerging where companies are increasing the use of variable compensation plans that are linked to individual performance. Companies that have eliminated ratings altogether also implement process controls to manage compensation awards. For example, group calibration sessions (where managers review their employees, and justify pay decisions to peers and executives) are becoming more common. Likewise, managers are being given more discretion over the amount of an award, provided they are within budget requirements and guidelines. One technology company, Autodesk, for example, allows line managers access to compensation survey “banding” data specific to the jobs they supervise. Managers then use this data to determine employees’ annual salary action. Even with these changes, the reality remains that under a pay-for-performance philosophy, which most companies espouse, the lack of formal ratings means that new ways to justify pay decisions must be adopted. This frequently involves process-based solutions versus restrictive, rules-based ones. LAUNCHING A PERFORMANCE MANAGEMENT RESET: IS IT THE RIGHT MOVE? 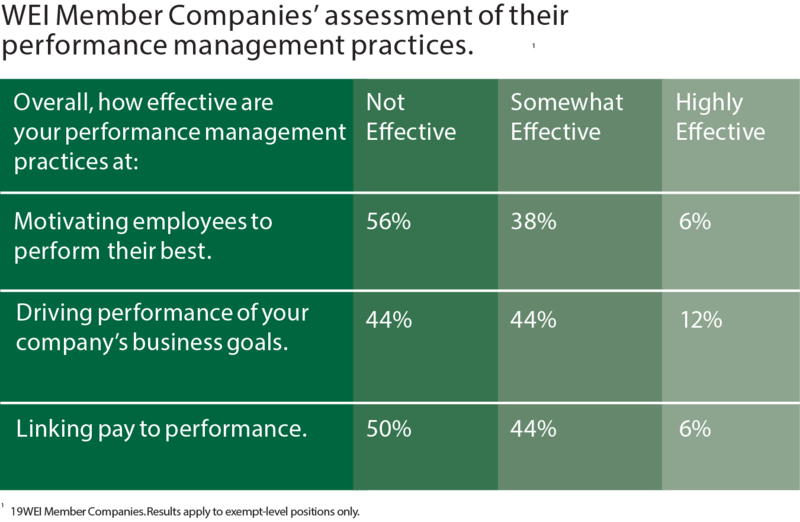 Is a sweeping performance management reset the right move for a company? The short answer is, it depends. Any change to a major talent practice is a significant event, especially one that impacts employees’ careers, pay and standing in the organization. Making this leap means making a highly disruptive change that involves risk, resource dedication and time. Required is a well-designed and executed strategy, and a change-management plan (in addition to unwavering leadership support). Not all organizations have the appetite to commit to this level, and if not, it’s better to table the effort for another time. Assuming that the time is right, the positive impact can be significant. Case study research from early adopters shows that these updated practices impact metrics, such as employee engagement, attrition, knowledge and skills, goal performance, accountability, communication and leadership effectiveness. In addition, richer workforce data is available that enables better insights into organizational dynamics, such as cross-functional collaboration and internal networking. Given the major changes underway in the utility industry, combined with these broader performance management trends, it behooves companies to consider leveraging some of these updated practices to their advantage. To use a colloquialism, the genie is out of the bottle. 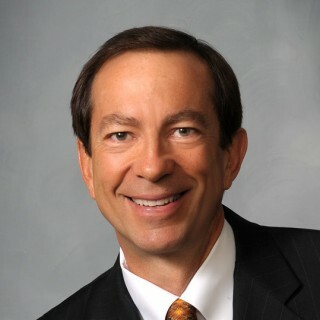 Larry W. Norton is a principal at GeNovo Consulting, LLC and is an industrial/organizational psychologist. He has worked for and consults with utility and energy companies throughout the U.S. and Europe. He can be reached at: larry.norton@genovoconsulting.com.